First off, if you don't know what method acting is, it's the technique of acting in which an actor aspires to complete emotional identification with a part. How do they do this? They spend every waking minute becoming the character. A perfect example is Robert Dinero driving a cab on weekends in Manhattan prepping for the role of Tavis Bickle in the movie Taxi Driver. No joke. 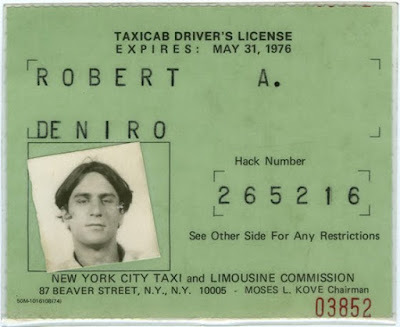 Here's his NYC Taxi Cab License. As far as Jim Carrey is concerned, I guess he went one step further for the movie Man On The Moon by spending every waking minute during production living the life of Andy Kaufman, and his alter ego lounge singer character Tony Clifton. How do I know this? Because I just watched an amazing documentary on Netflix called Jim & Andy: The Great Beyond. If you haven't heard of it, here's the trailer. In this behind the scenes look at the production of Man On The Moon, you get to see how far Jim Carrey took this role. Terrorizing the entire production crew, and causing anxiety for the great director Milos Forman — One Flew Over the Cuckoo's Nest and Amadeus. To be honest, I never knew Jim Carrey was such a method actor. I've always admired his work. Particularly his comedic roles in Dumb & Dumber and Ace Ventura, and his more serious roles in The Truman Show and Eternal Sunshine of the Spotless Mind. But, now that I've seen this wonderful documentary on this amazing artist's craft, I have to admit, I am now an even bigger fan of the great Jim Carrey. And, if you haven't seen the movie Man On The Moon, do yourself a favor, watch that first, then watch the documentary. You'll thank me for it. Cheers!